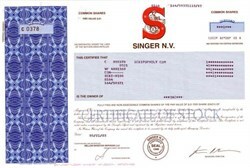 Beautifully engraved low serial # certificate from Singer N.V. . This historic document was printed by the Security-Columbian Banknote Company and has an ornate border around it with a vignette of a woman using her sewing machine, sitting within of the company logo. This item has the printed signature of the Company's Managing Director. The Singer Company, once the world's leading producer of sewing machines, was the successor to I.M. Singer & Company, established in 1851. Isaac M. Singer had patented improvements resulting in the first commercially viable sewing machine. Edward Clark, who joined the firm in 1854, provided the planning skills and business acumen that ensured the firm's success. Clark ended the so-called �Sewing Machine War� between Singer, Elias Howe, and other patent holders by organizing the first U.S. patent pool, which remained in effect until 1877. The company introduced its first treadle-operated machine in 1856, and Clark introduced installment selling the same year. The firm was incorporated in New York as the Singer Manufacturing Company in June 1863, Clark being determined to prevent the partnership from becoming entangled in disputes among Singer and his heirs. Singer took his shares and moved to Europe, where he pursued the good life on a grand scale. The company constructed a factory in Elizabethport, N.J., in 1871-72 that was then the largest in the world devoted to the manufacture of a single product. Singer was reincorporated in New Jersey on February 20, 1873. Singer quickly developed a worldwide sales organization. It built its first foreign factory at Glasgow in 1867. This was replaced by a much larger plant at nearby Clydebank in 1882-84. A second factory at Podolsk, Russia, followed in 1905. In the same year, Singer absorbed its leading American rival, the Wheeler & Wilson Manufacturing Company. The Russian factory was nationalized after the 1917 Revolution. When high tariff barriers were erected during the early years of the Depression, Singer was obliged to create two additional European subsidiaries, La Compagnia Singer per Macchine da Cucire, which built a plant at Monza, Italy, in 1934, and La Compagnie Singer Soci�t� Anonyme, which built another at Bonnieres, France, in 1935. Singer prospered during its first hundred years, but in the seven years following its 1951 centennial, the U.S. domestic sewing machine market collapsed. The amount of home sewing dome by American women declined sharply, and increasing Japanese imports caused Singer's market share to drop from 66% to 33%. The company made attempts to diversifiy into electronics and aerospace. It was renamed The Singer Company on May 16, 1963, and over the next decade became an important defense contractor. The sewing machine business continued to shrink, as more women sought careers outside the home, and in mid-1986 it was spun off to a separate subsidiary, SSMC Inc. After the 1987 stock market crash, the company was captured by Paul A. Bilzerian, a corporate raider, who quickly sold off eight of the twelve Singer divisions, including all rights to the Singer name. SSMC Inc. was sold to Semi-Tech Microelectronics (Far East) Limited on April 6, 1990. The much-shrunken Singer Company was renamed Bicoastal Corporation on October 16, 1989. 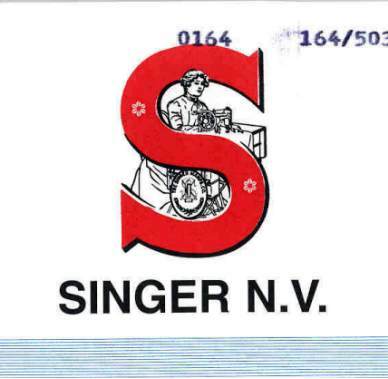 Singer N.V. was incorporated under the laws of the Netherlands Antilles on December 21, 1999. Effective September 2000, as a result of a successful Chapter 11 reorganization, Singer became the parent company of several Operating Companies formerly owned by The Singer Company N.V. ("Old Singer"), as well as acquiring ownership of the SINGER� brand name, one of the most widely recognized and respected trademarks in the world. Through its operating companies, Singer is engaged in two principal businesses, Retail and Sewing. The Retail business consists primarily of the distribution through company-owned retail stores and direct selling of a wide variety of consumer durable products for the home in selected emerging markets, primarily in Asia, Mexico and the Caribbean. Retail sales activities in these markets are strengthened by the offer of consumer credit services provided by the Company to its customers. In some of the markets where it operates, Singer is recognized as a leading retailer of products for the home. The Sewing business consists primarily of the distribution of consumer and artisan sewing machines and accessories, produced by Singer and certain third- party manufacturers, through distribution channels operated by its Sewing Operating Companies and through third-party distributors and dealers, as well as through the Operating Companies which operate Singer's Retail business. Singer is one of the world's leading sellers of consumer and artisan sewing machines, with an estimated worldwide unit market share of 26% (excluding China, the former Soviet Republics and Eastern European countries).